As most of my followers know, my posts are usually up and running before many of you are out of bed. Well, today blogger was "down" and it is finally back "up". Thanks for waiting for me! I hope everyone had a nice weekend. Ours was filled with friends, wine, beer, and lots of yummy food. Can't beat that! So, I stole this recipe from Meg, over at Be Fit, Be Full. She has a great blog, if you don't already follow her. Those east coast girls seem to have endless places to visit, eat at, and in general just have a good time! Don't get me wrong, I love the Midwest, but we all know everything travels so SLOW to get here in the middle of the country. Hence, why Iowa is just know getting their first Trader Joes. 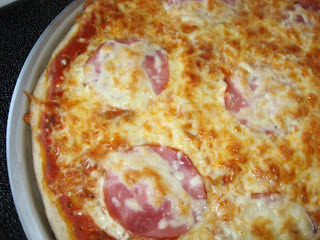 I made homemade pizza last night - which is usually our Friday night or Sunday night meal. Those are the two nights during the week where I don't feel like cooking anything elaborate. Therefore, pizza it is. Combine water and yeast and let sit for a few minutes. Stir in salt and flour and mix on medium high for 5 minutes (I used my Kitchen Aid mixer with the dough hook). Drizzle in olive oil while it is mixing. When soft and elastic, remove from bowl and cover with more olive oil. Put back in the mixing bowl, cover with a dish towel and let it rise for 1 hour. After it has risen, punch down and divide in half (this makes two pizzas). I froze the other half, as it was just the hubby and I eating last night. 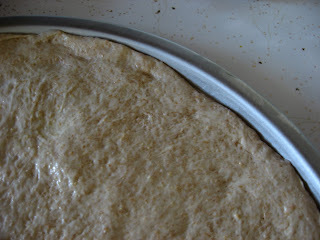 With oiled hands stretch dough to cover pizza pan. 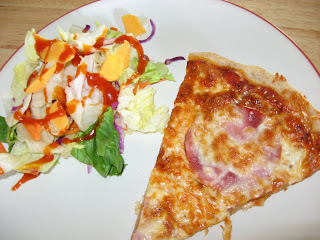 Top with sauce, toppings and cheese. Bake at 425 degrees for 10-15 minutes. This crust is SO GOOD. It gets nice and crispy, which reminds me so much of many restaurant pizzas...but right in my own home. In our house it is usually mushrooms, Canadian bacon, black olives and sometimes some peppers. Can't seem to venture away from that combo! I LOVE PIZZA! I could seriously eat it every.single.day. Homemade is the best. My fav toppings are mushrooms and onion and lots of sauce! Just like Julie, I can eat pizza every single day and not get sick of it! Pepperoni is probably my favorite - with sliced jalapenos!! Pizza is my most favorite food in the whole wide world! My favorite toppings are veggies. I just made my first homemade pizza crust...it was kind of intimidating but I did it! I love goat cheese on my pizzas along with every veggie I can find, especially the shrooms! Yum! Yum pizza! My favorite is tons of veggies with plops of goat cheese. I know plop is not the best word to use..but that's the only way I know to describe it! I love a loaded veggie pizza. Unlesssss I've had a few drinks :). Then pepperoni all the way! hehe.